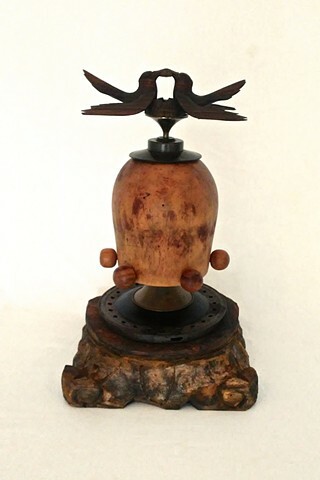 Assemblage, the three dimensional cousin to collage, utilizes preformed natural or manufactured components, commonly referred to as 'found objects'. The history of this art form is well documented. My introduction to it took place years ago while traveling in Vermont. There I came across an old fashioned hand-drill in a second hand store. Turned at an angle, with its red wheel juxtapsed against a contoured steel shaft, the drill appeared to me as a complete sculpture. I experienced this state of perception by voluntarily setting aside my recognition of the tool's original purpose. I decided to purchase the item and soon began to explore how it might relate to other chosen objects. Spatial relationships began to emerge and as they grew in number, a new more complex order was established. Objects were forced to subordinate their original identity to a larger context, something more commanding. Interpretation of the overall piece was no longer limited to the identification of individual objects. This transformative process is what I wish to communicate to viewers. Visual perception, involving the interplay between site and interpretation, is grounded in multiple academic disciplines. My interest in the subject originated in college where I dedicated myself to the study of psychology and art. I have found this background to be useful in guiding decisions on how to construct and express my work. In studying viewers' reaction to my work I have noticed that their initial response is often based on their familiarity with a single component in a piece.. However, upon further viewing their interpretation broadens to include relationships formed between multiple objects. This more holistic viewing is often accompanied by some degree of surprise and amusement, realizing that their imagination is suddenly engaged. "What does the piece do?" some have asked. I then can say, "You tell me". It is at this stage that my art becomes whole and validation is achieved.